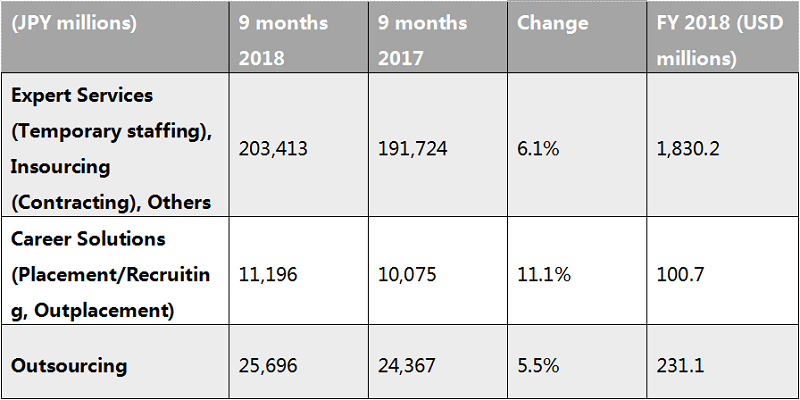 (Apr.15, 2019, /staffingindustry.com/) Japanese staffing firm Pasona Group (2168: JP), reported revenue for the nine months ended 28 February 2019 of JPY 243.3 billion (USD 2.18 billion), an increase of 6.4% compared with last year. Revenue during the period was boosted by all segments. Gross profit and operating profit was boosted by increased sales in insourcing and outsourcing. Pasona added that companies that were acquired through M&A in the previous year also contributed to an increase in revenue. Through its subsidiaries, Pasona provides human resource solutions in Japan and internationally. It offers temporary staffing/contracting, outsourcing, and outplacement services. It also offers additional services, such as a childcare service; foreign language education abroad; public solutions, such as employment of persons with disabilities; and other social welfare businesses. Pasona said temporary staffing expanded significantly during the period, especially in Indonesia and Vietnam. Looking ahead, the company forecasted revenue of JPY 343.00 billion (USD 3.08 billion) for the full year ended in May 2019.